This is a tomato-based sauce from Amatrice, Italy. It is based on guanciale (salt-cured pork cheek or jowls), pecorino cheese and tomatoes. If you can’t find guanciale, use pancetta. If you can’t find pancetta, chopped bacon (preferably unsmoked) will do in a pinch, but the resulting sauce will not taste exactly like traditional Amatriciana sauce. Crush the tomatoes and put aside in a bowl. Heat up the olive oil in a skillet over medium heat. Add the guanciale to the skillet and sauté until crisp. This will normally take 3-5 minutes. Add black pepper and garlic to the skillet and stir it in. Cook until soft, while stirring often. This will normally take about 8 minutes. Add the tomatoes and reduce to low heat. Cook until the sauce is thick, stirring occasionally. This will normally take 15-20 minutes. Stir in the Pecorino cheese and add salt to taste. Amatriciana sauce is a pasta sauce based on guanciale, pecorino cheese and tomatoes. It derives its name from the town of Amatrice in the mountainous Province of Rieti in the heart of Italy. Amatriciana sauce is usually served over spagetti or bucatini. 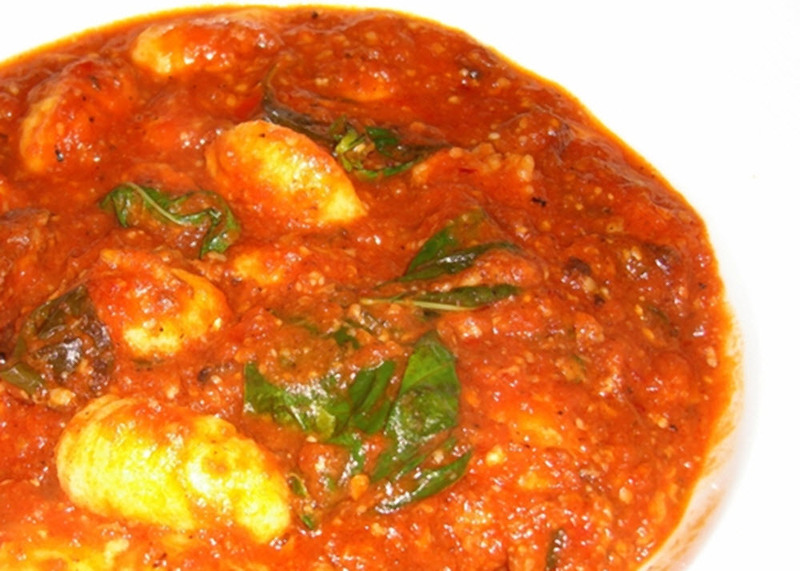 Many variants of the recipie exists, and the sauce can be varied almost endlessly. You can for instance switch out the olive oil in favor of strutto, and adding some chili flakes to make the Amatriciana sauce more spicy is also popular. Recipies without the pecorino cheese are quite common in Italy, which makes the sauce suitable for those who don’t eat diary. Onions are usually absent from local Amatrice recipies, but are sometimes seen in recipies circulated abroad.